I've been quiet in this space for a while. I was surprised by the challenges this Advent season brought, and I've had difficulty putting the struggle into words. I feel I've found my voice again. Thanks for your patience. I think it was Christmas 1992. The joy of the season had been tempered by the Gulf War and soaring gas prices, and we were still trying to pay off school loans and make the monthly mortgage payment. Bob and I agreed to spend only twenty dollars on each other for Christmas. 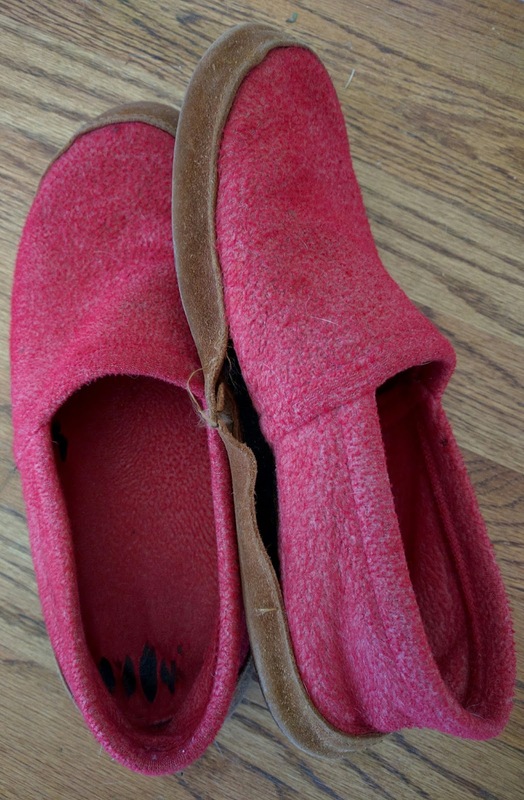 This pair was soft and warm and protected my feet from the chill of the hardwood floors of our turn of the century, sparsely insulated home. The only thing I didn’t like was the color: reddish pink. Despite that, I wore them. As the years turned into decades, I became more attached to them. And that perplexed me because I’m not sentimental. I don’t attach feelings to things. Besides the fact that they're still functional, I’ve often wondered why I can’t bear to part with them. Deep down, I know the reason: they’re a tangible representation of my husband’s love. Today, the leather soles are slick, the seams are pulling away from the uppers, and if I washed them, I’m sure they’d fall apart. The world seems to be falling apart and the depravity of man is tempering the joy I’m trying to find this season. I’ve experienced a heaviness I can’t shake. I feel a deep need for a physical reminder that Love will overcome the deepening darkness. I know that Love came to this world in the form of a Person, Jesus, the One who came to be physically present with those He created in the midst of darkness that was deep then too. Why does this physical representation of Love seem so hard to grasp? Maybe grasp isn’t the right word. I'm wrestling with the reality that I don’t have the feelings to go along with that knowledge this year. It’s hard to be in this place when the season seems to demand I be happy and joyful. What I’m coming to realize is that God’s Advent message for me this year is that I’m not going to get the “feels” to go along with what I know. But that doesn’t mean His Love isn’t real, tangible, the best physical reminder ever given. After all, He is Emmanuel--God WITH us. If that’s not Love, I don’t know what is. Such depth to your honesty. I'm at a place myself, where, even if I grasp the joy, it can be fleeting and even tinged with a hint of sadness, because I miss my mom so. I think its okay, to sit with whatever we feel, and just honor that, at times when it doesn't naturally occur. Loved the story behind the slippers!